You can have any kind of Franklin home that you'd like, and make it comfortable, but log home living is the coziest you can experience. Picture having your family over for the holidays, and sitting all gathered around at the fireplace after an evening meal. Imagine how cool the interior would be in the summertime, and how warm it would be in the wintertime. Imagine waking up and opening your eyes to log-constructed walls and hopping over to the kitchen for hotcakes and maple syrup for breakfast with your family in your log cabin home - ah, yes... that's the life! You need to ensure that you protect your log home that provides you with all of these comforts and pleasures. 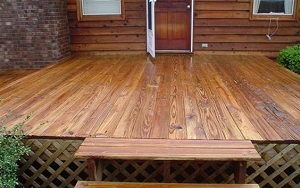 If you do not protect the wood it will become damaged and worn due the effects of the sun, wind, rain and bugs. That is where our trained professionals come in, They have the knowledge and the experiecne to ensure that your log home and wooden decks are protected from these dangers and that they will look great for years to come. So if you would like to have our professional staff assist you with your log home or wooden deck needs give them a call and see what they can do for you. If you're looking for a professional dock cleaning contractor in Franklin, then give us a call 252-266-9457 or complete our online request form.